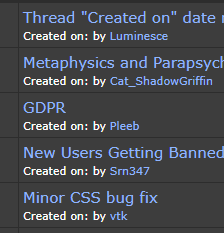 Just realized the boards' threads are supposed to have a date for when they were created but, well, don't. I don't know how long it's been like this, but it's probably possible to fix it right? Using the Dark theme if that matters. It should be fixed now. The issue was a MyBB update that changed how you get thread date and time in a template. The updater didn't fix our templates and nobody noticed the missing creation dates. It's still broken for me. Yeah. It worked briefly for me and now it's broken again. I don't know what's doing it and will try to look further into it tomorrow. For now I've simply removed the "on:" so it just says created by.